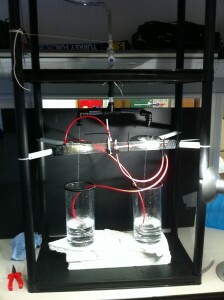 Who says water and high voltages don’t mix? 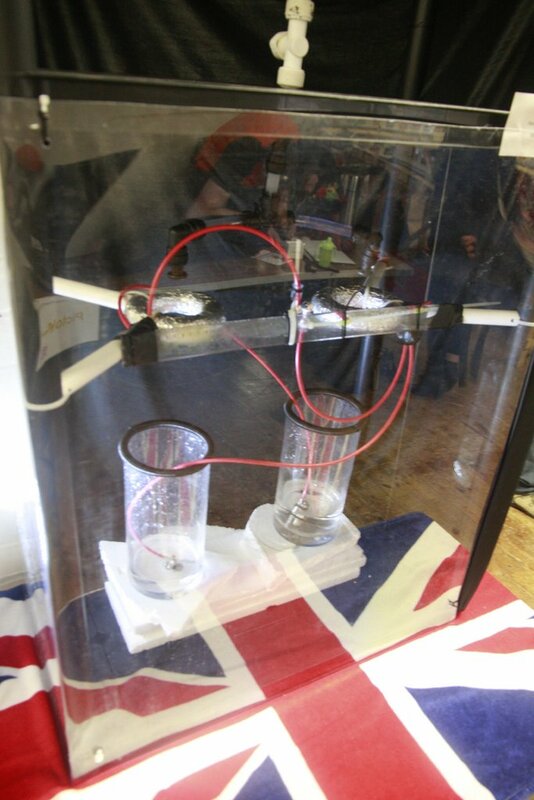 Among Lord Kelvin’s many and varied inventions sits the water dropper electrostatic generator, or Kelvin’s Thunderstorm, a simple device with no moving parts that generates thousands of volts from the flow of simple, unadulterated water. 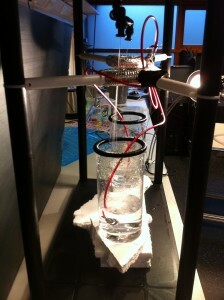 Water flows from one supply through two nozzles positioned above metal rings, and lands in two collecting jars. Each jar is connected to the opposite ring and that is it, it’s that simple! Because water conducts electricity, charge in the water moves to cancel any electric field. Because the stream of water falling from the nozzles breaks up into individual droplets, the conductivity stops at the break-up point a few centimetres below the nozzles allowing attractive charges to be separated by gravity, increasing the voltage. 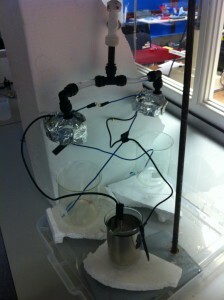 The energy for the sparks comes from lifting the water up to the supply tank at the top each time the jars are emptied. Imagine the left ring has a slight positive charge, perhaps from some passing radio wave. The water flowing through the ring has extra negative electrons to cancel the field because it conducts and opposite charges attract. this stream breaks into droplets and these droplets with negative charge are collected in the left hand jar. This is connected to the right hand ring and this new negative charge attracts positively charged water to the right hand side, collecting in the right jar and adding to the left ring’s positive charge. 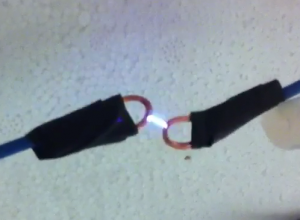 This continues with the effect getting stronger and stronger until thousands of volts build up, making a spark.